Download this free corporate website template if you want to make a job board responsive website without much effort and want to keep your site up-to-trend. 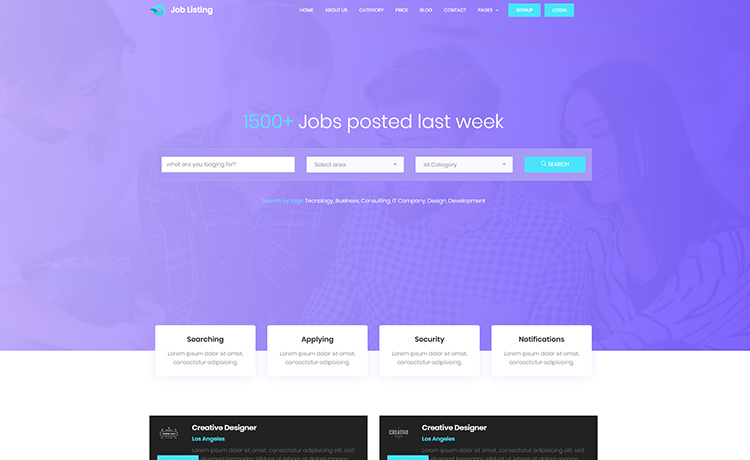 Built with Bootstrap 4, JobListing is a free corporate website template for creating a digital job portal. JobListing’s look is clean and enticing, helping you to create an out-of-the-box website. An andvanced and diversion-free search option lets the job seekers find their desired jobs. Let’s talk about the charming and above the fold possibilities this free HTML5 template keeps inside it. Right from the beginning, it presents a sticky navigation as well as drop-down menu. Moreover, two buttons for signup and login obviously come handy. On top of that, the advanced search bar with multiple filters right above a hero header is something aids users for getting what they want. Also, the carousel slider and featured job section are two more clean and useful section, undoubtedly. Furthermore, the right sidebar with multiple small sections contains many essential information. Besides searching jobs, people also can get to you with the functional contact form. Additionally, Google Maps help them to see where your office is located. Surprisingly, for the beginners, the documentation will help a lot to understand the ins and outs of the free Bootstrap template. And, a widget-rich footer, incorporated with Instafeed and social icons can get the users connected to your organization. You need free website templates if you are about to start without much knowledge on web technology. Our quality checked templates are for all level users to build an awesome website on any niche – without effort. Let’s begin with Baikal or Posh, our two gigantic and truly flexible premium products. can i remove footer credits ? and can i use this template for my client ? You are not allowed to remove footer credit.